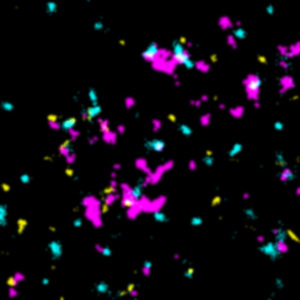 Image of co-localization of nascent DNA (pink) and SAMHD1 (blue) or CtIP (yellow) showing increased association upon damage of cells to camptothecin (DNA damaging agents). Standard anticancer treatments, such as chemotherapy, target rapidly dividing cells by damaging their DNA. A newer strategy is to undercut cancer cells' ability to repair DNA damage. Yu is associate professor of radiation oncology at Winship Cancer Institute and Emory University School of Medicine. Co-author Kim is director of the Center for Drug Discovery, part of the Emory-Children's-Georgia Tech Research Alliance. Research in Yu's lab was supported by the National Cancer Institute (R01CA178999, R01CA178999S1) and the Department of Defense (CA160771).